With the introduction of blockchain technology on top of the Internet, we are greeted with a limitless world of opportunities for cooperation, economic efficiency, operational expansion, and technological discovery – all in pursuit of a trustless global society. The future might have more to offer than we can presently imagine, and the limitations of being tied to one platform will possibly perish. In this world of tomorrow, blockchain platforms will be able to exist as economic and social operating systems, where the success of a project relies not on the exclusiveness of being on one platform, but on increasing adoption through operating on a variety of platforms. To posit an example, while projects on the Ethereum platform currently only operate within the boundaries of Ethereum, we might see a future where projects spread their activity to all platforms, such as NEO, Waltonchain, Cardano, Stellar, etc., in order to expose themselves to different markets and partners (similar to the way corporations build apps on operating systems today – being on iOS, Linux, and Windows provides more reach than being exclusively tied to one). A recent step we saw in that direction was the partnership between Mobius and Waltonchain, indicating that the present platform of a project (Mobius is currently on Stellar) doesn’t necessarily stop them from expanding to other platforms, as long as they are mutually beneficial and allow for interesting opportunities. We often forget that blockchain is about decentralization, which means no ownership models and striving towards a common future for the general benefit. Looking at platforms should be like looking for opportunities for technological expansion, not seeing them as rivals (how can there be rivalry when there is no ownership?). In this article, I attempt to speculate on one such potentially mutually beneficial cooperation that could aid in pushing the blockchain space towards an ecosystem of co-efficiency. 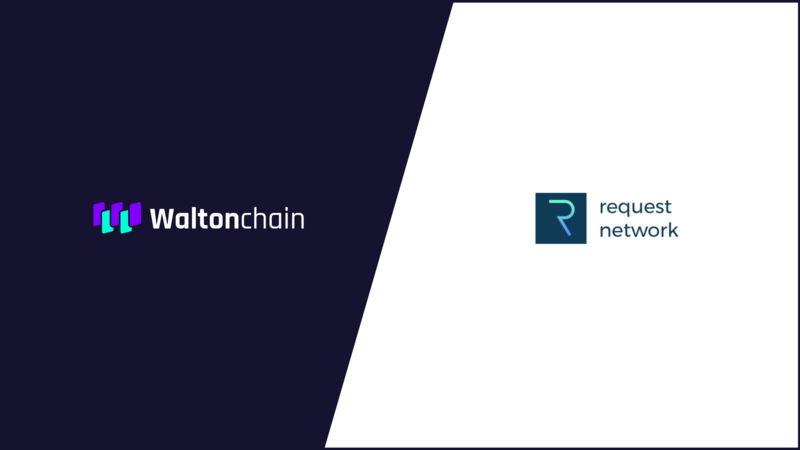 In order to do that, let’s first briefly summarize the two projects – Waltonchain and Request Network – and then proceed with what they could offer each other and the world. Waltonchain is a project that aims to create a world in which we can connect anything and everything to each other – this is the third stage of interconnectivity (following the computer and the Internet) referred to as the Internet of Things (IoT). Waltonchain goes on to eliminate the issues of the current IoT, which is based on centralization and access control, creating a new protocol referred to as the VIoT (value internet of things). Since every transaction is recorded in the public ledger, we can achieve value and information exchange safely without requiring trust to be formed in advance, allowing borderless transaction safely and without revealing any sensible information. What is most important is that their unique value proposition comes from the integration of hardware (RFID, environmental sensors, global positioning systems, laser scanners, etc.) with blockchain (distributed, point-to-point network, with parent and child chains to solve scalability issues), which creates a foundation for being one of the most unique and economically required projects to root for in the space. Request Network is a decentralized network that allows anyone to request a payment (a Request Invoice) for which the recipient can pay in a secure way – often viewed as the PayPal 2.0. All of the information is stored in a decentralized authentic ledger based on blockchain technology, which results in cheaper, easier, and more secure payments while creating a wide range of automation opportunities. Their value proposition resides in the aim of creating a financial system that could potentially become the standard for invoices, accounting, auditing, and payments in cryptocurrencies and fiat assets. Cryptocurrencies aren’t only for transactions – they can also be a source of passive income. With functions such as mining and staking (which help secure the network), people can increase their holdings gradually by putting trust and effort into the network, which in return generates rewards. With the growth of various platforms, people have become fascinated by the idea of living off those staking/mining returns in the future, where their portfolio value can generate enough passive revenue to pay for living expenses. One such platform is Waltonchain, which has created an ultimate passive income structure for value investors, introducing multi-layer passive income. While most cryptocurrencies rely on one consensus mechanism (such as mining OR staking), Walton has combined the two to create an easier barrier of entry and ease-of-use in passive revenue generation – a PoW+PoST (proof-of-stake and trust, meaning more time equals higher rewards) mechanism, where token holders can either mine, stake, or do both. Additionally, people who have put a significant stake in the network can enjoy the benefits of masternodes or guardian masternodes, which decrease difficulty even further while increasing benefits. However, it isn’t all bells and whistles, as passive rewards equate extra responsibilities and headaches, such as converting tokens to currencies used in our daily lives, or taking care of tax responsibilities from the “dividends” generated. With the introduction of Request Network, Waltonchain rewards can be automatically converted to fiat (or any other desired currency, for that matter) and sent to your bank account/wallet via smart contracts, which means you can easily, without having to do any conversions yourself, live off the passive income hassle-free. Furthermore, with the exponential growth of the market, people have expressed various concerns and questions regarding tax obligations, since many of us just “stumbled” onto a big portion of money without ever thinking it could appreciate so quickly. Accounting could turn into a serious headache, but not when money just appears in your account, with the accounting for it done automatically by the added benefits of Request Network (it will file the conversion, make the tax calculations, and automatically set a fund aside in an escrow to later pay for taxes). While Waltonchain miners/stakers have a lot of benefits to gain from such a system, there are also benefits to Request Network investors – such as stability and increased number of transactions based on mining/staking rewards, a potentially massive number of transactions within the ecosystem (between child-chains), a link to massive partnerships tied to Waltonchain that would allow institutional adoption of cross-currency transactions – all of which creates more volume and liquidity, and makes the REQ token more valuable. All in all, this relationship could build a completely automated passive income system, which would decrease costs in relation to converting money, as well as saving on accounting fees and time. Another mutual benefit is the automation of commerce, which both projects have stated as one of their priorities. In the world of tomorrow, where most of the economy is tokenized and hundreds of cryptocurrencies are circulating, we need a way to bridge everything together through advanced IoT (hardware and software interconnectedness). While there are already various payment options to choose from in the traditional sense, the process is tedious and, quite frankly, outdated. Also, when dealing with e-commerce or traveling around the world, we have to constantly worry about converting our money to native currencies or paying high conversion fees for an easier checkout process. With Waltonchain and Request Network working together, you can walk into a store and walk out with an item – it is that simple. No carts, waiting in line, or checkout processes. This is where Walton’s RFID tags and readers come into play. Similar to how Amazon GO has created an automated store, Waltonchain can do it better based on improved technologies and interconnection between all currencies. When you enter a store, the RFID gate reads the RFID tag in your phone that is linked to identifying your public address of the wallet. When you leave the store, the RFID gate identifies the item that was taken, and based on that information (by using the RFID tag information or AI’s face detection algorithms to determine the person leaving with the item) initiates a smart contract, where the store’s software (based on RFID and AI information) sends the person a Request for payment, for which he/she can pay with a single swipe in any currency. Furthermore, with the decrease in transaction fees, accounting, and labor cost (not to mention time cost), item prices can fall drastically due to decreased merchant costs, which means that sellers can make prices lower while maintaining the same profit margin. The system is beneficial for everyone and will make things direct and transparent. Having a second escrow platform (PayPal) on top of e-commerce sites like eBay is completely unnecessary, as the merchant has to accept another 3% + 0.3 USD fee per transaction. With a high number of sales, those fees add up to a lot of money, and therefore the cost has to be passed onto buyers by increasing prices. This is also why Amazon doesn’t use PayPal, as a middleman taking additional cuts for returns serves no purpose, not to mention there is zero protection when it comes to digital items (PayPal almost always sides with the buyer, meaning that they can just lie and fake proof for refunds). Person A sells a PlayStation, for which Person B puts 0.2 ETH into a Request escrow contract. Person A then receives a notification and ships out the PlayStation, inputting the shipping number into the escrow contract. Throughout the tracking process, the RFID tag is being scanned in various locations, providing Person B real-time updates as to how far away the item is, as well as estimated time of arrival. Once Person B receives the PlayStation, Waltonchain takes that external data from the shipping company (DHL for example) and executes a smart contract, which is tied to a 24-hour timer. After 24 hours, the escrow automatically releases the funds to Person A, or Person B can push funds out of the escrow if unsatisfied with the item. Furthermore, with this system, Waltonchain and Request can create a protocol which drastically diminishes monetary incentives to ever scam, as all items have unique properties based on the RFID tags (meaning that the seller can’t just send a brick), while the buyer can’t lie that he didn’t get the item (since only the seller has the signature to push the funds back to the buyer). Another benefit in the relationship between Waltonchain and Request are the extensive government projects Walton is already working on, which would allow Request an access to start bridging the blockchain with traditional systems. Specifically, instead of cryptocurrencies “fighting” against government intervention and involvement, we should facilitate the transition to a decentralized world for all parties. What I mean by that is that governments could benefit directly from the relationship between Waltonchain and Request, as it isn’t set out to impose on them, but rather provide complete transparency and data integrity for all parties. All interactions can be automated and verified, and so can the bookkeeping, as all required information will be available on the public ledger. Governments can audit individuals and companies through Request, as well as gain access to real-time big data, which means that organizations can transact efficiently and freely, with governments exercising regulatory practices to maintain oversight. We often forget that governments are necessary, but the problem is the overbearing control and authority the governments have. If we can decrease that authority by allowing them decentralized access, while also giving people complete control over their own finances and data, everyone can operate efficiently in society while the government still maintains the ability to pursue malicious activities. The more we try to fight and zone government out of the new world of tomorrow, the more resistance they will put up and regulation they will attempt to enforce. Instead, we should be working together for a mutually beneficial system, and this is exactly what Request and Waltonchain can provide – complete transparency regarding both physical and virtual items (based on tags and scan), as well as finances, but in a decentralized manner, without surrendering control and ownership. We could provide access to information for anyone without relying on third-party interpretation of data. This means, for example, that not-for-profit organizations, governments, enterprises, etc. can use that data to generate solutions much faster than going out and collecting data themselves, which is costly and time consuming. Even that is not the end of it – the utilization of child chains also means that every company can exist on the blockchain and interact with others on the ecosystem. With the integration of smart contracts, as well as data sharing and efficient cooperation, the city/country can, in a sense, be a big, living, digital organism – a truly smart economy. Additionally, Waltonchain is working on smart cities, and this type of system should be precisely the one adopted by all of those cities – and perhaps even nations – for everyone to live in harmony. There are a host of other advantages to Waltonchain’s system, but as ThelateMercutio points out, without first decentralizing data collection, you cannot be sure that the data is 100% reliable, and when managing the world’s supply chains or smart cities, this is crucial. WTC has so much to offer – it could automate smart contracts, smart cities, smart waste management, etc., all the while using REQ as the payment facilitator and bridge that links all currencies in the interconnected tokenized economy. Aside from all of the benefits this relationship could provide, there is also a more imminent factor which shouldn’t be overlooked. With the recent Coinnest partnership, we can expect ICOs to be launched on Waltonchain platform with direct access to an exchange upon project launch. When we add Request Network to the mix, we can be looking at revolutionizing the ICO process for blockchain startups. No more would people have to buy ICOs by sending certain coins – they could instead fund the ICOs with any currency they desire or hold instantly, and be credited with the ICO coin in return. Upon executing the Coinnest partnership, Waltonchain could be looking at cross-currency exchange in relation to tokens on their platform, as well as the ones traded on Coinnest. The addition of Request would then allow taking part in ICOs by sending any currency you have/hold, and receiving an appropriate ICO coin amount in return (all within seconds). Also, those ICO coins will immediately get an exchange once the project launches, meaning increased liquidity in case you want to sell them, while selling/exchanging them could also be done against any other currency you desire in return. To put it simply, you can literally host ICOs without the limitation of people being required to fund it with certain coins. To go even further, that ICO now immediately has its own child chain with preset conditions, upon which they can start coding additional layers, and also have access to Waltonchain’s hardware to create automation services and enjoy all benefits the blockchain offers. This means that this mutual relationship can provide startups the ultimate complete ICO starter pack, which would be hard to ignore. Anyone familiar with Request Network is no stranger to the scaling discussion regarding their current platform, Ethereum. Ethereum is known for its limited scalability and other issues, problems that the team is hopeful Casper and sharding will fix. However, those implementations may prove to be more difficult and time consuming to perfect, and Request might need a scaling platform sooner than that, going by their 2018 roadmap. As Walton’s code is similar to that of Ethereum, transferring over to Waltonchain would be seamless for Request, and they could enjoy the benefits mentioned above right away with infinite scalability. In their recent blog, Request also stated they are looking for partners in the areas of IoT integration and supply chain traceability – something Waltonchain is known for and has a lot to offer, with possibly the best and most unique value proposition. Aside from Request solving their scalability issues, the partnership could also be huge for Waltonchain, as it means any token could transact with Waltonchain without limitations – we would have infinite cross-currency transactions not only between tokens on Waltonchain, but with every currency out there. For example, if some project from the NEO blockchain wanted to pay for services from Waltonchain, they could do so without having to buy WTC. Instead, they could send any token and it would automatically be transferred in WTC to Walton. It would literally remove the only limitation Waltonchain has – the interaction between WTC and all other currencies. They already fixed that on their own child chains, but this would open up connection with everything – arguably the ultimate VIoT that they are looking to achieve. This connection would also mean that in future smart cities, all tokens could transact with each other, while enjoying the hardware–software integration for real-time access to big data. There are a lot of reasons to be excited for the world in which objects, machines, and artificial intelligences automatically connect, interact, negotiate, and pay each other. With the relationship between Waltonchain and Request Network, we could remove various limitations of current blockchain technology and connect all information and currencies together into a global tokenized ecosystem. Solving the problem of separation between real-life data and virtual data while allowing smart contracts to automatically verify completed conditions, both physical and virtual, we can imagine a world in which smart contracts can execute without human intervention, and do so in any currency. The relationship between Request Network and Walton’s VIoT smart systems can connect the item and identity tags in the real world via RFID technology, which can successfully achieve the interconnection of all things and create an era of true smart economy, while also allowing us to transact freely in any currency within that system. For more in-depth information about each project, make sure to also read the individual articles I wrote about Waltonchain and Request Network. This article is a speculation piece part of our new series that aims to analyse areas of cooperation between various projects that could benefit the future of blockchain. I am not suggesting any of the projects should work together, but merely look into the possibilities of the benefits each party could have potentially working together. This is an excellent, visionary article on the potential that lies ahead for VioT and blockchain. What a phenomenal potential that exists for these companies to impact the growth of these markets. Having been in tech for over 40 years, I believe that the fundamentals are lining up to precipitate unprecedented upswing, so grab on and invest now !!! !